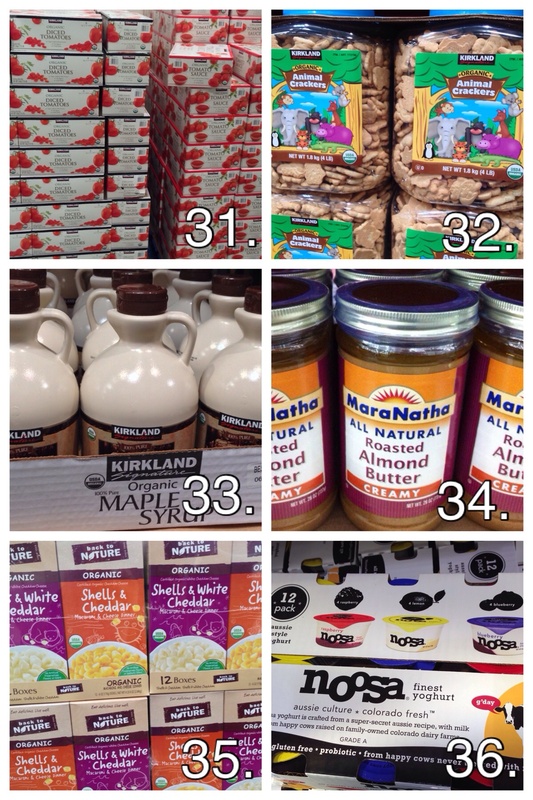 We are back with our favorite healthy foods at Costco, part 2! This list provides many nutritious snack options for kids, which we hope you find helpful since school is just around the corner. Frozen Organic Blueberries – During the summer, it’s nice to get fresh blueberries, but when they’re not in season they can either be hard to find or really expensive. Frozen blueberries are a great option to have because you can do just about anything with them that you can do with fresh blueberries. I use them in baking, smoothies, fruit ice cubes, and my daughter even loves eating them as is! Frozen Organic Antioxidant Blend – The most perfect thing to make a smoothie! I blend them with a little splash of fresh orange juice, yogurt, or filtered water! Rummo Organic Spaghetti – the best organic pasta out there for the best price! GoGo Squeez Organic Applesauce – I buy these as a treat once in a while for my daughter. She is obsessed with these apple sauce pouches! They are completely all natural and made from organic ingredients. Also great for taking on a plane or long car rides. Organic Sugar – If you’re still using refined white sugar, please stop! It’s processed through animal bone char. Always buy, raw, organic, or vegan for a cleaner option. Nature’s Bakery Fig Bar – My kids love these fig bars and eat them for breakfast with a glass of milk or as a quick snack. They come in three different flavors: raspberry, blueberry and regular (fig). Unlike Fig Newtons, these fig bars are organic and filled with wholesome ingredients. Kirkland Semi-Sweet Chocolate Chips – Since I bake a lot, this huge bag of chocolate chips is a great value for us and lasts for a long time! I love making chocolate chip cookies, molten lava cakes, and chocolate covered strawberries with them. Good to know: these chocolate chips are responsibly sourced and fair trade. 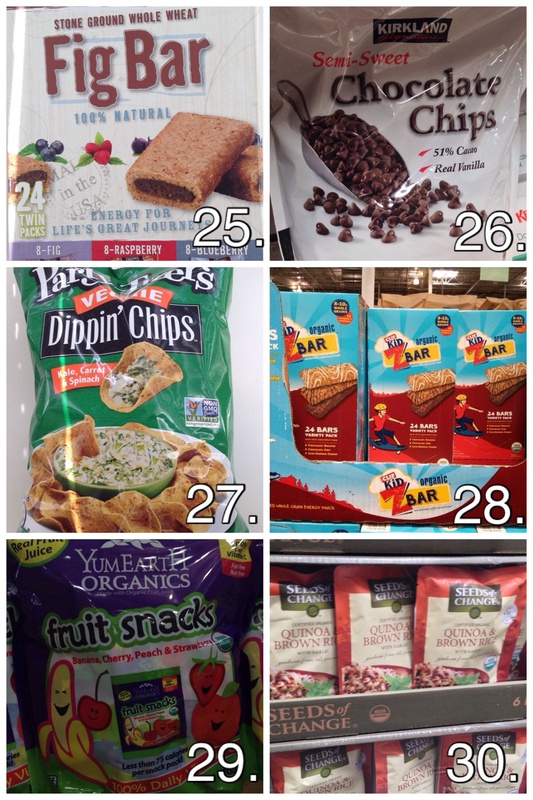 Veggie Dippin’ Chips – I bought these chips on a whim on my last Costco chip because I was looking for an alternative to regular tortilla chips, which are almost always made from genetically modified corn. I was intrigued by the ingredients, these chips are made from actual vegetables, including kale, carrot, and spinach. Best of all, the ingredients are GMO-free and the chips are shaped in a bowl-like shape, perfect for holding dips or salsa! Organic Gummy Fruit Snacks – My girls are kind of obsessed with these! I literally have to hide these from them in the pantry! They’re all organic, GMO-free, and no harmful dyes. And the small packets they come in are great for a lunchbox treat! Quinoa and Brown Rice – When I am making chicken or fish, I like having these quinoa and brown rice packets handy to have a nutritious healthy side. They take two minutes to make and taste delicious. Organic Canned Tomatoes – Costco carries organic tomato paste, crushed/diced tomatoes, and tomato sauce. And the best part is that they come in BPA-free cans! You can tell if a can is BPA-free by looking on the inside. If it’s a light orange colored lining, then that means it’s BPA-free. If its the usual tin colored or white then that means it is not BPA-free. Organic Animal Crackers – What kid doesn’t love these?! They’re really yummy. And more importantly, you can clearly see the shape of each animal, making it easier to play with! Organic Maple Syrup – All organic, and tastes like the more expensive stuff, but for a lot less. Win-win! Almond Butter – A wonderful alternative to peanut butter! Among all the nuts, almonds are the most nutritionally dense. Spread on a slice of whole-wheat bread and drizzle some honey on top for a quick energy-boosting snack. Organic Macaroni & Cheese – Don’t feel like cooking, but have to feed the kids? That’s when you make them organic mac & cheese! Kids love to eat it and moms can feel less guilty about it because its organic and free of artificial dyes. Of all the “healthy” mac & cheese brands I’ve tried, I like the Back to Nature brand the best! Noosa Aussie Style Yogurt – These yogurt cups are great for the kids’ lunches! They are all natural, made from rGBH free milk, and contain less sugar compared with other brands.